Tweet A couple of weeks ago I was begging my Aerosmith contact to get an interview with a member of Aerosmith. 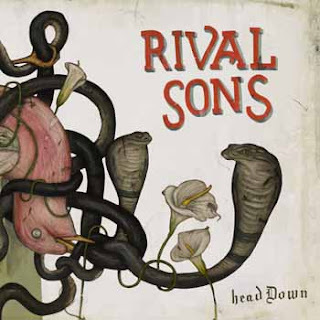 While my contact looked into setting this interview up he sent me the album “Head Down” by Rival Sons. My mind was blown away the second I heard it. I love bluesy rock music with dynamic vocals. Rival Sons is a great band. The first song I heard was “Keep On Swinging.” If you’re not hooked after the opening riff of that song then you will be as soon as Jay Buchanan starts singing. I was lucky enough to get the chance to talk with Jay about the new album and how they put the album together in 20 days…from scratch. Zoiks! : Hey Jay! How are you doing? Jay Buchanan: I’m doing good Bob. How about yourself? Z! : Pretty good! Thanks for taking the time to do this interview. JB: Yeah, of course! I’m just enjoying a cup of coffee here. Knocking off some emails and wasting time. Staring at fake news. Z! : Nice! I got the chance to hear your album, “Head Down.” I’ve actually heard it a few times now. I really like it! It is one of my favorite albums of the year so far, even though it doesn’t technically come out, physically, in the US until next January. Is that correct? JB: Yeah. Here in the States, the physical release will be in January. Z! : But, it is out on ITunes right now? JB: It’s out on ITunes, and you know it is out in Europe and the UK, and its out in Canada. It’s really strange how that works because our US audience can get it, but it hasn’t been released yet. But I think it all has to do with distribution and with the various branches with different labels and the companies. Media and all of that stuff we do for them makes it easier to sparse things out to different territories. Z! : I had read somewhere that it had only taken you guys 20 days to write, record, and mix the album. Was that something you guys had planned to do, or did it just kind of work out that way? JB: No. It was very intentional. We did our previous records under pressure and time and in the same way, and we do that to not give ourselves an option to think about it too much and second-guess ourselves creatively. As a writer, you know, I am a very compulsive writer. I write every day a little bit, but for the band we go in with no material. I am also a singer/ songwriter and I write a lot of different types of music, but for our band we want to create on the spot and then record it right away as soon as the song is born and just capture that energy. So what you end up getting, what the listener ends up getting, and what we are shooting for then, if they buy the record or the download or the CD or whatever the first time they are listening to it, each one of those songs that the listener is getting is the first or second take. That’s what they are getting. There is normally only about three takes on like two songs on the entire record. But, they are listening to us play it for the first or second time ever. We do that so we won’t get too comfortable and you get the most honest picture that we are capable of presenting to everyone. Z! : I think you kind of answered my next question. My favorite thing on the album is how you captured the live sound of the band. It is something that I think a lot of albums lack these days. Is that really the secret, is just recording right after you write it in one or two takes? JB: Well, if that’s the secret. Sure, I definitely see that as a huge contributing factor to that sound. If you have a song and you play through it ten or twenty different times and you are wearing yourself out in the studio, and if you know exactly what you’re going to do, naturally it is going to sound that way. But if you don’t know what you are doing and you’re not exactly sure what’s going to take place in the next four seconds with the song as you are doing it, it’s going to give you that natural spark, I think. That’s what we shoot for, and it’s good to hear that you hear that as well. It comes from us being really a live band, and we like to shake things up and play things just a little bit different every night just to avoid recital and when we get into the studio we keep up that uncertainty. Z! : So, take me through the song-writing process. You go into the studio with no ideas and you kind of jam as a band together, and then when do the lyrics come in? How does that go together? JB: Yeah. It comes together two different ways. We’ll get a jam going. You know, there will be a guitar riff or a bass riff or something like that. You know, one of us will come in with something and everyone will just start to jam along, and if it has legs, like if everyone can connect to it, and if it feels good, great! We’ll proceed and start working on it right away, but if it doesn’t really feel very good, you know we’ll work on it for forty-five minutes or something, but it’s not really clicking it’s kind of apparent, you know if it just doesn’t feel right. So we’ll get the music going, and right away once we get the music going, I start on lyrics and melody immediately. So, it either goes that way or I also write complete songs on my own and then bring it to the band. Then while we are in the studio and they’ll be jamming out, or when we get back to the hotel or the cottage that we stay in, I’ll go to my room and write all night, and bring a couple of songs in during the session. I am very adamant about making sure that any songs that I bring into the band that they are songs that we started while we were in these sessions. I don’t bring in previously written bits. But, it is really one of the two ways. I think it is more often the former, where we we’ll get together and just create spontaneously that way. Z! : There are a lot of great rock bands out there today, but I feel like too many of them are trying to reinvent the wheel when it comes to rock music. You guys are kind of proof that playing old-fashioned rock and roll, you can still sound original and relevant. It seems like you really embrace that term rock and roll. What is rock and roll mean to you? JB: Well, first of all it has got to have the blues in it. There are a whole lot of rock bands out there that are doing really well, but there are not a lot of rock and roll bands out there. I look at band like what Jack White has been doing over the last ten or twelve years and that’s rock and roll. You look at bands like the Black Keys, you know it’s pretty rock and roll. But both of those are also a hybrid of rock and roll, and they’re both blues based. They are what rock and roll really is. I don’t really think about it too much, but if you were to ask Scott, our guitar player, I’m sure he’d be really quick with an answer, but this is the first rock and roll band I have ever been in in my life. Rock and roll really to me is blues based, fist-pumping, I don’t know. It is like blues turned up. Blues music amplified and played with more… I don’t know. More something. It’s just louder. It’s the same complaint and it’s the same cry as regular blues, it’s just through a megaphone. Z! : it is almost as important to be a great business man as it is to be a great artist, yet I can’t imagine anybody that starts playing music does it because they want to be a business man. Is it difficult to separate the business and the creative, or does your business just have to become creative business? JB: Well, I think that it is really important to build a team that you can trust, and you trust their judgment, and keeping a sharp business acumen. You want to be able to do that no matter what. It doesn’t matter what field you are in. You could be a wood-worker, or a …, or a cobbler, or a cook, or whatever. You want to have your wits about you because no matter what you’re doing in life, you want to be able to make sound decisions. So, exactly the same thing applies for my position. I have a hard time taking my head out of the creative and artistry zone, but you want to make the decisions no matter what, so you try to keep an eye on the ball. You try to keep an eye on the things that are going on with all of these people who are working so hard for you to set things up from management and booking agents, and publishers, and all of these people. It just comes down to either you want to keep your head in the game with good decision-making or not. Z! : It was a couple weeks ago that I came across the video for ‘Keep on Swinging,’ and that’s what really drew me to your band, and the song alone had me hooked, but I loved the video as well. Was that concept something the band came up with? JB: (laughs) Actually, no. Not at all. It was the same team that made our first video. Greg Ephraim had the idea, had the concept of us getting us into a church and handling some snakes, and this treatment with some girl and she is on fire and has to get baptized. I wasn’t thinking about any of that stuff when I was writing the lyrics, but he thought it would be fitting. The band, we were out on tour and so busy and so we went through ideas and we were getting everyday different treatments from different directors, producers… oh, I want to do this, I want to do that, and Greg sent in this idea and we thought, you know what, that sounds crazy enough. Would I like to be in a church in front of a congregation, like a real congregation, handling some snakes, and singing some rock and roll? Hell, yeah! I’ll check that one off the bucket list! You better believe it! I’ll do that! So, no that wasn’t our treatment. Greg Ephraim thought that one up. Z! : What did you or how did you feel about the video process. I mean, I have helped out on a few independent movies and shorts, and I found the process painfully boring. What is it like from the music video side? JB: You mean making videos? Having to deal with all of it? It’s the worst man! It is the worst Bob! It’s the same thing… I am sitting here talking to you, and this is terrible! Inevitably we’re going to be talking about making music and where are you coming from, what does this mean, and what is the validating… I don’t know. I don’t think about this stuff. I just make music! We tour, and it gets really tricky when you start having to quantify your ideas come from and who you are and what your identity is. It’s one of those things that is like, why do you do what you do? Man, I don’t know! I always wanted to do it, and it just feels good when I do it.